Johnny Sexton last night took home the Irish Independent Sportstar of the Year award, and was joined on-stage in a heartwarming moment by his godfather, Irish Independent columnist Billy Keane, as he accepted the trophy. Billy has watched Johnny develop as a player from a very early age, when the Dubliner would visit his relatives in Listowel and keep the legendary playwright, John B Keane - Billy's dad - awake practicing outside their famous pub. Sexton is now the World Rugby Player of the Year, and has scooped a host of other individual awards after a remarkable year that saw Ireland win a Six Nations Grand Slam and Leinster claim a PRO 14/Champions Cup double. 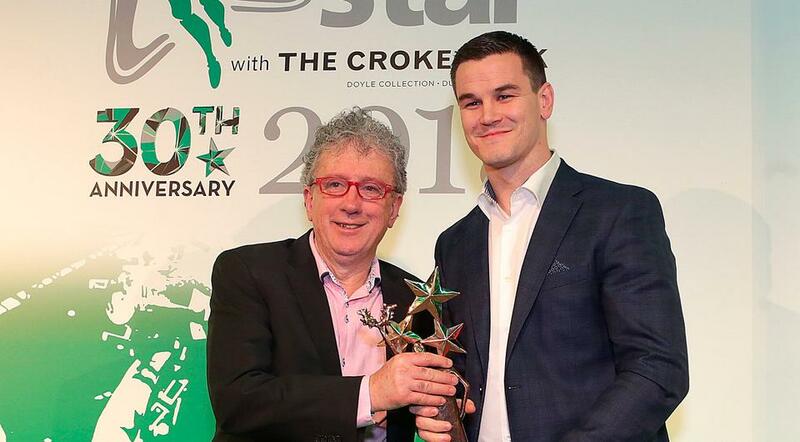 Speaking at last night's Irish Independent Sportstar awards at Croke Park, Billy Keane paid tribute to his godson. "I think what is most important about him is that he is a good fella," Keane said. "You can win all the awards in the world, but he is a good fella. And he is my first godchild to win the Irish Independent award! "I'm very proud to be your godfather, even if I forgot your birthday occasionally." However, Johnny Sexton was on hand to remind his godfather of one particularly memorable birthday present. "He gave me one other gift when I was a young fella," Sexton said. "I was in my granny's sitting room in Listowel and he walked in and had the takings from the bar and a big bag of change and he took a fistful of 20ps and threw them at me and said, 'happy birthday, you little b****x!'" Sexton has been honoured on multiple occasions in 2018, but he admitted that there was something extra special about picking up the Irish Independent award. "It is nice when people recognise you and winnning World Rugby Player of the Year was nice, but there's something nice about winning Irish awards," Sexton said. "I'm very proud to be Irish and to be in this room with all these other Irish sportstars."